Years ago we were invited to our friend Sally’s house for a Christmas get-together of hot mulled wine and snacks. She met us at the door with a piece of blood-stained paper towel wrapped around one hand and holding sauce pan in the other. Sally returned with a proper bandage on her hand. Coho, it turned out was a beagle that belonged to one of Sally’s daughters. Coho had jumped up in an attempt to take a sausage roll out of Sally’s hand and had bitten her badly in the process. Coho looked at me and sniffed my shoes. Once the party was underway and the guests started filling their plates, Coho began circling us. Suddenly, he leapt into the air, long ears flapping like wings, and grabbed a bun from my wife’s plate. She was so startled she dropped her glass of wine. Coho sniffed the wine on the rug but passed on it. Sally went to get a sponge. Before she got back, Coho made another leap, this time at the table, and knocked a plate of sausage rolls off and onto the floor. Within seconds, he scarfed down every roll. Far more amazing than Coho’s singled-minded attack on the food was the group’s reaction. They all thought Coho was cute beyond belief. Everybody stayed on guard, while Coho attempted to jump up and take food from our plates. There was a lot of laughing. People who love dogs are very tolerant. We managed to eat our food without any injuries. A few guests gave Coho little bits of food to keep him at bay. After the eating was finished, Coho calmed down and let us pet him and stroke his ears. A beagle’s ears are phenomenal. I couldn’t believe how silky they felt. Suddenly I was struck by an entrepreneurial thought. 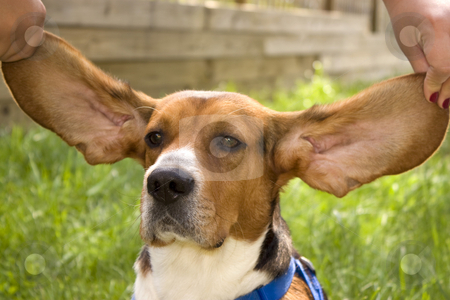 A beagle ear would be a perfect item to carry in one’s pocket to feel and stroke as a means of calming down. After all, worry stones were in vogue for a while. Worry stones are polished stones with a thumb-sized indentation to be stroked for anxiety relief. Apparently, they are actually used in some behavioral therapies to take the place of nail biting. But a soft, silky beagle ear would be so much better than a stone. Even those without anxiety problems would enjoy the feel of one. I decided to do some research. I found out that Coho’s behavior is typical of beagles. They are constantly sniffing out food sources and are very aggressive in going after anything they find. As a consequence, they are not great pets for apartments; they need backyards. But where would I get the ears? I decide to call a vet. “If you were putting a beagle down, is there any way I could get the ears? “I’d rather not say.” I didn’t want to give my business idea away. There was a long pause, and I started to suspect they were having the call traced, so I hung up. If I were doing it again, I would look into China as a supplier of beagle ears. 😂 you are a kick! !